Nice headstamp, high-quality brass. What else could I ask for? A Handgun Planet giveaway is in progress! Click here for more info! After seeing at least a few boxes of this stuff (or the blue box version) at just about every major match I’ve shot in the southeast over the past few years, I finally managed to get my hands on some. First impression? It’s good stuff. Atlanta Arms has been in the business for over 35 years, so I guess I shouldn’t have been too surprised, but it was nice to see this kind of quality when I opened the box. And the best part was that the quality didn’t stop there! Compared to some things we’ve tried lately, that’s a big deal. 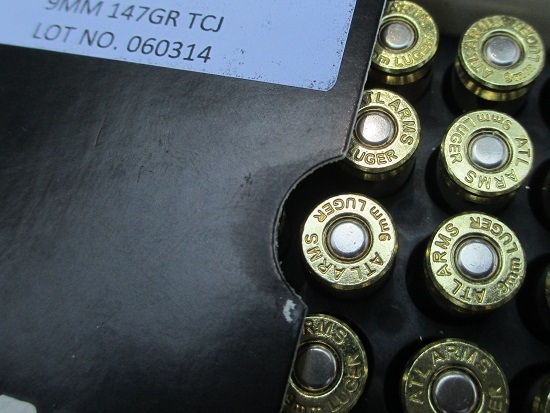 For one thing, every round that leaves the factory is chamber-checked. I case-gauged the first ten rounds and (not surprisingly) everything looked good. This load is spec’d to run about 880 fps out of a Glock 17 barrel, which makes minor by a safe margin. It’s been adopted by the shooters of Team Glock as well as the US Army Marksmanship Unit’s Action Pistol team, which are two organizations that could have picked any ammunition that they wanted. I didn’t have time to chronograph it during this first range session, but it ejected very consistently and felt about like the 147 grain Asym Precision match load we tested earlier this year (here) recoil-wise, so I’ll believe the spec for now and verify next time I hit the range. That’s high praise because I (and everyone else) really liked the feel of the Asym 147 grain. 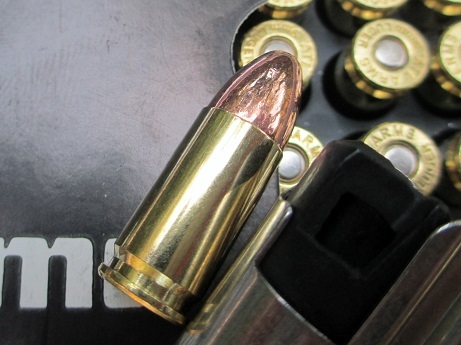 This load uses what appears to be a plated bullet, but I had zero instances of jacket separation and it was extremely accurate through both my Wilson Ultralight Carry 5″ and a Springfield Armory 5″ 1911. It seems to have thicker plating than some other plated bullets, but I’ll verify that when I get into some more detail next time. We’ll run it through a Glock and some other stuff next time as well, but for now I can’t recommend this load enough. Especially when the retail on the new production (black packaging) is only $22 per 50 (blue packaging/reman is only $15.50). NO failures to fire, feed, shoot, hit, or look good. So there’s also that. I’ve come to appreciate ammo that does exactly what it’s supposed to do. For me, it’s an extra little “plus” when I open the box and it looks great too. As you can see, this stuff has a really nice polish to it, zero tarnish (which doesn’t affect anything, but still), and a noticeable amount of swagger. The swagger is a little tough to catch in a photograph, but I’ve been assured that it’s included with every box. 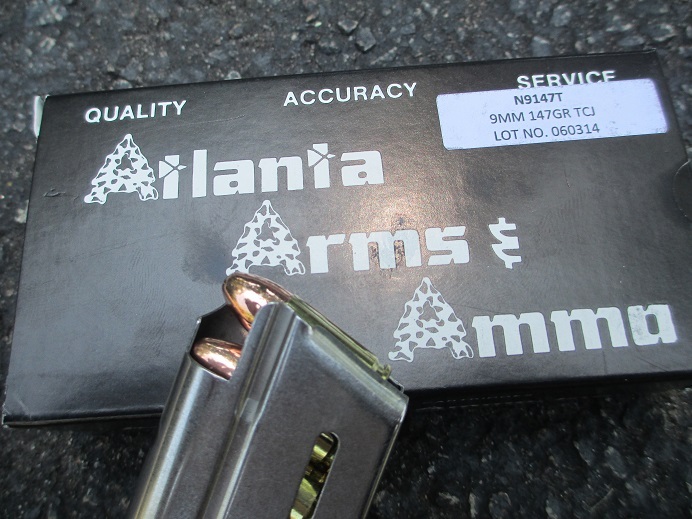 For more info on Atlanta Arms, or to find a dealer near you, check out www.AtlantaArmsandAmmo.com.